Reminds us that we are on this tiny little planet and vulnerable to the complexity that surround us. 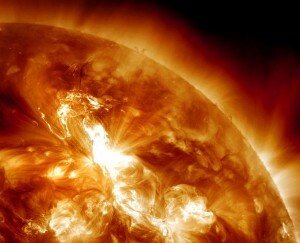 A powerful solar eruption is expected to blast a stream of charged particles toward Earth today (Jan. 24). On the National Oceanic and Atmospheric Administration scale of radiation storms, this one ranks S3, which means it could cause isolated reboots of computers onboard Earth-orbiting satellites and interfere with polar radio communications. So no big deal, but glad it is not an S5. This entry was posted in technology on January 24, 2012 by KB.